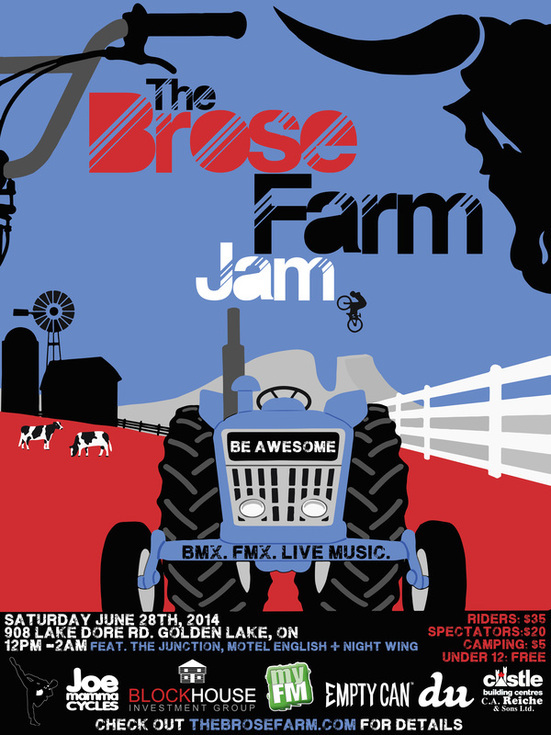 We’re super excited to announce the 4th year of The Brose Farm Jam this Saturday June 28th, 2014. This awesome festival of dirt is unlike anything you’ve seen before! Our main event is a BMX Dirt Jump Competition featuring professional riders from across Ontario and Quebec battling it out on one of the largest BMX dirt courses open to the public in Eastern Canada. Not only have we worked hard to expand our course by 3 times it’s original size from last year, but this year riders will also be competing for $1500 in cash prizes as well as product donated from our generous sponsors. In addition to the BMX action, local Freestyle Motocross rider Reed Boardhurst will be leading two FMX shows on our 70ft trick jump. We will also have live musical performances from Toronto’s The Junction, Motel English, and Night Wing. If you work up a hunger be sure to check out our exclusive food vendor, Urban Cowboy Eats. Purchase your tickets in advance and be entered into a Prize Pack Draw worth $400! As usual, overnight camping is available so don’t let being from out of town stop you from coming!